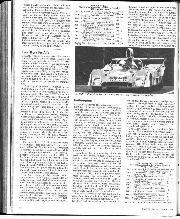 The combination of a fuel-consumption formula (all the cars had to run for 20 laps or more without refuelling), the absence of many graded drivers, and—worst—the lack of Matra, Alpine, Ferrari or Alfa Romeo prototypes, all combined to make this year's Vingt-Quatre Heures du Mans decidedly a non-event, and the spectators reacted by staying away in their thousands. Victory always seemed within reach of the two well-prepared Gulf Research Racing GR8s, which took turns at leading the race, and on Sunday afternoon the achievement was recorded by Derek Bell and Jacky Ickx. 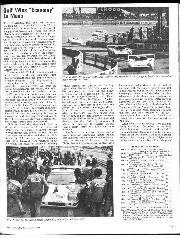 The second car had been delayed with alternator problems, and then by a fault in the differential, and finished in third place behind the Ligier-Ford DFV driven by Jean-Louis Lafosse and Guy Chasseuil. The Automobile Club de l'Ouest seemed to be in trouble from the very beginning. First they introduced the fuel-consumption formula, virtually dictating a 25% improvement in consumption to the 3-litre teams. Then, having been banished by the CSI from the World Championship for Makes, the ACO had to cancel the vital test weekend because the CSI introduced a clashing sports-car race to the calendar. And when the final entry list was published, it showed a heavy preponderance of Porsche 911 Carreras, which filled no fewer than 28 of the 55 starting places—just over 50% of the total. Just where endurance racing would be now if Dr. Porsche had not founded his own car company is hard to imagine, for with four more Stuttgart cars in the 3-litre prototype class the company was better represented than ever before!